Graham Zimmerman leading the ice crux of his and Chris Wright’s new route The Indirect American (WI4+ M7, 1,000 meters), Mount MacDonald, Selkirk Mountains, Canada. Photo: Chris Wright. 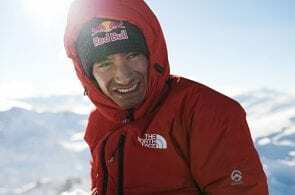 From November 11 to 13, Chris Wright (USA/UK) and Graham Zimmerman (USA/NZ) made the first ascent of a long, difficult mixed route on the North Face of Mount MacDonald at Roger’s Pass in British Columbia’s Selkirk Mountains. 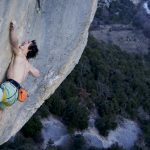 They named the new route ​The Indirect American ​(WI4+ M7, 1,000 meters). Tackling a conspicuous, iced corner system, the route was a longtime project of Wright’s, who had eyed it repeatedly over years of skiing in the area. While the pass and neighboring Revelstoke are well-known to skiers the world over, the area has historically attracted relatively few climbers, far less than the more famous peaks of the nearby Bugaboos or Rockies. The Indirect American follows the red line. Photo: Courtesy of Graham Zimmerman and Chris Wright. Despite being home to a number of high-quality summer routes on excellent alpine quartzite—including the Northwest Ridge of Mt. Sir Donald, one of Steck and Roper’s Fifty Classic Climbs—the area’s typically bottomless winter snowpack is generally better-suited to sliding down than swimming up. 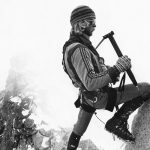 In addition to the issue of snow, the area presents a complex set of factors that must align for winter climbing to be feasible. Aside from the problem of conditions on the face itself, since MacDonald lies directly above the Trans-Canada Highway just past Roger’s Pass, it is closed to overnight use and multi-day climbing for most of the winter due to avalanche control. During some seasons though, a short window of time exists when suitable winter conditions can be found before the closure comes into effect. Additionally, for the route to be a reasonable option, the approach and descent need to be free of avalanche hazard and the weather needs to be clear, a rarity for the Columbias in late fall and early winter. Wright and Zimmerman both live in Bend, Oregon, and had productive fall seasons. Wright made the first ascent of his long term project ​Burning Churches​ (5.12b, 300’) at Smith Rock State Park and Zimmerman made the first “wintery” ascent of the North Face of Mount Wilbur (M5, 3,000 feet) in Glacier National Park with Justin Willis. 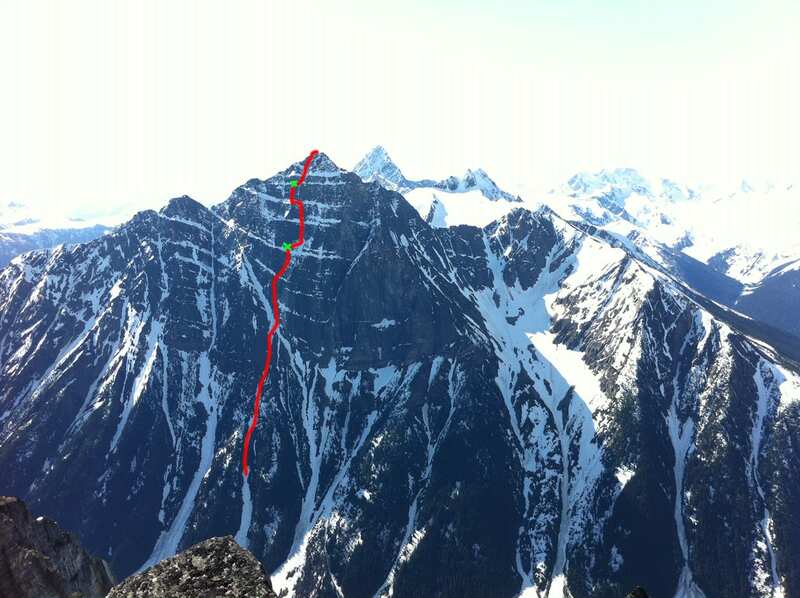 Despite fantastic rock climbing conditions at home, when the two saw an usual window of high pressure appearing in the weather models for Roger’s Pass a few days before the closure came into effect, they dropped everything and drove to Revelstoke. 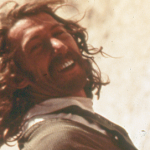 After a day of packing and scouting, Wright and Zimmerman launched early on November 11, planning to spend one night on the face. 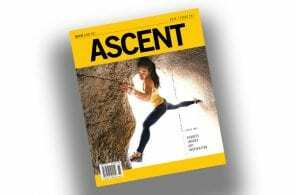 The first day of climbing started with a dark walk along the Trans-Canadian Highway, an icy creek crossing, and a steep approach to the base of the wall involving bushwhacking, snow wallowing, slide alder, 5th-class cedar limb scrambling, and devil’s club. 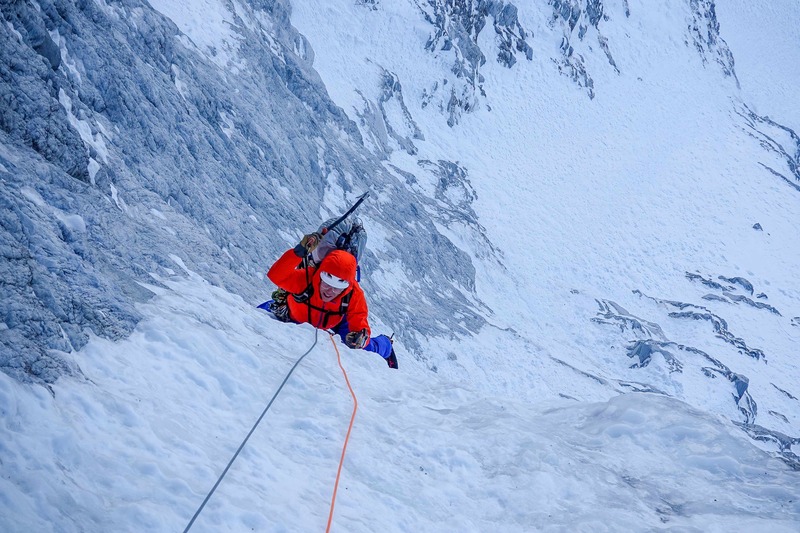 Once above the trees, the climbers moved unroped up the couloir below the start of the face’s difficulties. 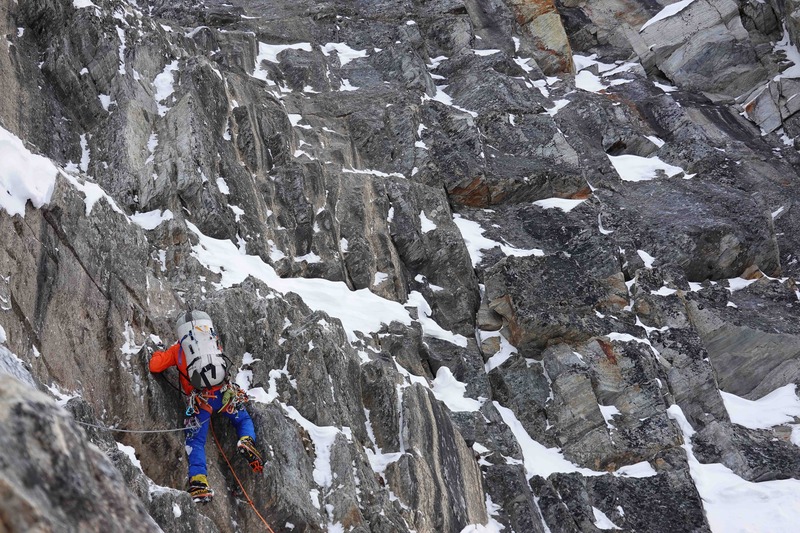 Roping up, they started mixed climbing on snow-covered, compact quartzite and climbed through the afternoon. The lower face was generally devoid of ice forcing the team left to terrain near the 1963 Beckey Route. As the short day came to an end they dug a bivy on an excellent snow ledge directly beneath the obvious line of ice that defined the middle of the route. Chris Wright seconding the ice crux of the route. Photo: Graham Zimmerman. 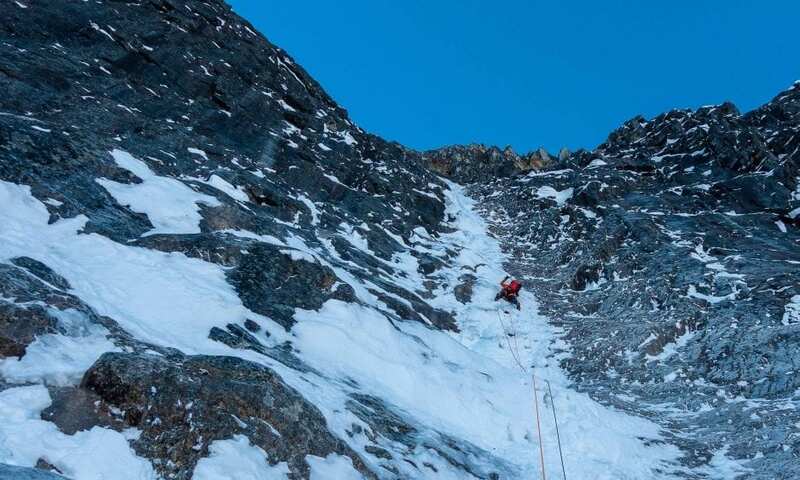 Once again starting at sunrise on the 13th, they traversed back into the primary weakness climbing four more high quality mixed pitches that led them to the east ridge about 50 meters from the summit. The weather, forecasted to deteriorate that evening, remained perfect as they topped out at noon. 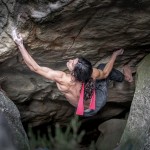 Wright leading the mixed crux. Photo: Graham Zimmerman. 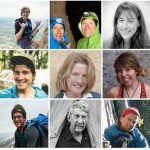 They downclimbed and rappelled the Southwest Ridge to the top of the Banana/Herdman Couloir which they rappelled into and walked down. This placed them at the top of the Crossover Slidepath, which they descended, reaching the road at 5pm. This descent was very efficient but traveled through extremely threatened avalanche terrain and would not have been reasonable without very low avalanche hazard. In the end, the route took the team 62 hours car to car with two bivies and cruxes of WI4+ and M7. Overall the climbing was generally sustained between M4-5 and was excellent. It is important to note that in the right conditions (better and more continuous ice and more consolidated snow) this route would be significantly easier, but given legal and conditions-based constraints, opportunities to climb the route in better conditions will be rare. The name ​The Indirect American, comes from the fact that neither Wright or Zimmerman were actually born in the states, nor are they particularly proud of the current state of American politics. Additionally, the line has some significant deviations from what would be the “direct” line, an invitation to future parties to correct.